In 1973, two films provided sleepless nights to very different audiences. For those old enough to see an R rated film or the under-aged with the ingenuity to sneak into an R rated film, it was "The Exorcist." For those whose religious scruples kept them out of the movie theater, the terrifying film was "A Thief in the Night," and children were more than welcome to watch. 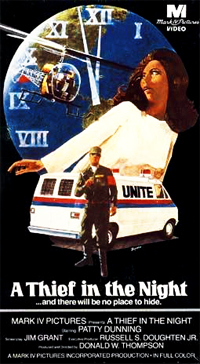 "A Thief in the Night" was made as an evangelistic tool, using the tropes and techniques of horror and science fiction films. Most famously, it used the device used in "Dead of Night" and "Invaders from Mars" of having the horrible things that take place be only a dream that proves real on awakening. The horrible events in this film are caused by the Rapture, when Christ takes all Christians from the world leaving all those who remain to face the Great Tribulation. Not surprisingly, this film that was predominately shown in churches, features churches. 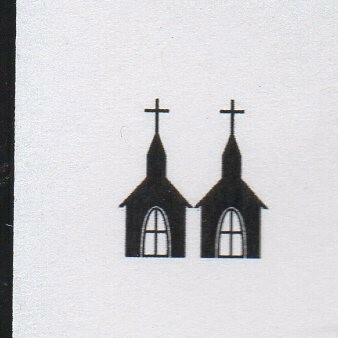 We see the outdoor sign of one of the churches. It reads, "First Church of the Open Bible - Pastors Frank W. Smith & Calvin F. Archer." There is also room for a message on the sign which was unfinished due to interruption by the Rapture, "The End is Nea." Prior to the Rapture, we see Pastor Balmer at work. He preaches at Open Bible and seems to be the senior pastor there, but for some reason his name is not on the sign. He goes to the hospital to pray for the victim of a venomous snake bite. We know that the victim, Jim, is the love of the film's heroine, Patty, and he's not a Christian. Somehow the pastor knows this also, praying, "May this boy's life be spared so he will have another chance to trust in You." Anyway, Pastor Balmer visits Jim, now married to Patty, at home. To save Jim from his snake bite, doctors used a blood transfusion from another man who'd survived bites. The pastor says that just as that man gave his blood to save Jim, Christ's blood will save him if he receives it. Jim becomes a Christian, but Patty does not. She says her pastor says you don't to worry about that theology stuff. We never learn the name of the church of Patty's pastor, Matthew Turner. We assume it's a mainline denomination because they don't preach about the End Times. Pastor Turner preaches, "Do these so-called basic tenets of Christianity make a difference in our lives? Would I appreciate the world's beauty any less if Christ's birth wasn't a virgin birth?" (Would that question be any more of a non sequitur if zebras were green and orange?) Pastor Turner goes on, "Would I respect people less if Jesus didn't perform miracles? Could I be so gross as to be responsible for the death of the Son of God? Would I be so harsh as to condemn people to a fiery pit? Could I be more merciful than God, who is reported to be love?" Pastor Turner is still around after the Rapture, but he feels really bad about misleading people back in the day. He can't sleep thinking of those he misled. Pastor Balmer is raptured (as one assumes is the case for Pastors Smith and Archer). This film provides an unusual case for the good pastor NOT being there in times of crisis. 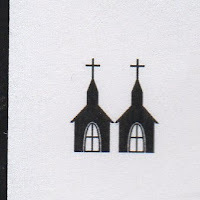 The bad church and the good church in "A Thief of the Night" average out to two steeples.